Middle East Forum director Gregg Roman appeared alongside Mouin Rabbani, a senior fellow at the Institute for Palestine Studies, and Sakarya University professor Norman Finkelstein on Al-Jazeera English on October 22 to discuss Benjamin Netanyahu's controversial statement that Palestinian Grand Mufti Haj Amin al-Husseini contributed to Nazi planning of the Holocaust. See video below right. moderator: Gregg, do you think Netanyahu expected such a backlash? Gregg Roman: No, but I also think there were several points in Netanyahu's speech that were not factually accurate, like Mr. Finkelstein said. For instance, he said the mufti died in Cairo in 1974 from cancer. He actually died in Beirut. 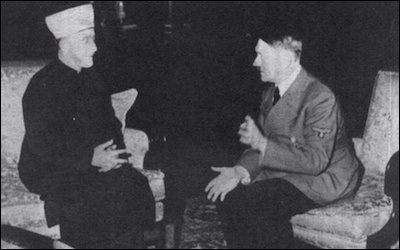 But I think the real element of what we have to look at here regarding the mufti's involvement, not just with the Holocaust but [with] Palestinian and Arab incitement against Jews, is the history of the mufti's meetings with Hitler. moderator: All right, but hang on a second Gregg. Let me ask you, why would the prime minister of a country, why would the prime minister of Israel, be standing in front of the world and making factually incorrect statements? Roman: Sometimes politicians make factually incorrect statements. However, I don't think he was trying to point to the historical record as his general point. I think what he was trying to point to was the linkage between the mufti, his ideological heir Yasser Arafat, and subsequently Palestinian incitement that's going on today, as being of the same lineage as the mufti's hatred toward Jews. That's the wider issue of what he was trying to bring up. The context in how he did it may have been incorrect. However, I have to say, the element, pathos of what he was talking about was correct. Mouin Rabbani: ... Trying to trivialize this by saying that politicians make factually inaccurate mistakes. Well, suppose that, for example, Mahmoud Abbas were to get up today and say, "actually, the Holocaust was not Hitler's idea, it was proposed to him by David Ben Gurion and Chaim Weizmann in order to justify the creation of the state of Israel." Imagine the outrage. We wouldn't have someone like John Kerry saying both side need to tone down the rhetoric. Imagine the outrage if a Palestinian leader had said something similar. So, to seek to trivialize this is, I think, quite obscene. I also do think, however, it raises an opportunity for another important discussion we need to have. And that is the role of the Zionist movement in the 30s and the 40s. Now, Netanyahu is the heir to that faction of the pre-state Zionist movement eventually known as revisionism, which was in fact inspired by fascism, albeit an Italian variant led by Mussolini. Um, and during World War II, in 1941, one faction of that movement, which was eventually led by Yitzhak Shamir, made an approach to Nazi Germany, during the Holocaust I should add, proposing an alliance with Berlin against the British, who then ruled Palestine. So, there's a long history here. Netanyahu today is the heir and the leader of that wing of the Zionist movement. Roman: ... So let me address the incitement narrative that I was asked about by the interviewer. Roman: The roots of Palestinian incitement come from Haj Amin al-Husseini, the former grand mufti of Jerusalem. In his ... [Damascus memoirs], written only in Arabic and not translated into English until 2014, when a book came out called Nazis, Islamists, and the Making of the Modern Middle East, we see that the grand mufti himself describes the protocols of his meetings with Hitler [inaudible] ... trying to claim responsibility for incitement that took place in North Africa and in the Middle East, even taking responsibility for the Farhud, which was the June 1941 pogrom against Jews in Baghdad. Rabbani (interrupting): It's documented. It is in the public record. Roman: ... that conversation that we're talking about was not an alliance against the British, it was an effort to try to extract Jews from Europe so they wouldn't die in the gas chambers.